We’d love your help. Let us know what’s wrong with this preview of Snowy Owl Invasion! by Sandra Markle. To ask other readers questions about Snowy Owl Invasion!, please sign up. Be the first to ask a question about Snowy Owl Invasion! Sandra Markle does an amazing job with her Animal books, whether it is an endangered species, or tracking animals such as the Snowy Owl. I have seen Snowy Owls at the airport near my home so this book helped explain why they have been here in the last few years and never before. In 2013 there was a Snowy Owl Iruption and they ended up traveling much further south than before. Scientists were able to band some of them and later put GPS trackers on them to see what their migration paths were. There Sandra Markle does an amazing job with her Animal books, whether it is an endangered species, or tracking animals such as the Snowy Owl. I have seen Snowy Owls at the airport near my home so this book helped explain why they have been here in the last few years and never before. What a fascinating book! I had never head of an irruption until this book. Snowy owls are beautiful (their babies are really cute) and this book has wonderful pictures of the owls. Great information and many resources at the end. Sandra Markle is an author I always know will produce quality non-fiction. Absolutely fascinating and right on my (very basic) level. Have you heard of the 2013-2014 snowy owl irruption? 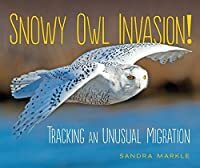 Sandra Markle’s 2018 book, Snowy Owl Invasion! : Tracking an Unusual Migration delves into this remarkable historical event, and deftly weaves in a thorough natural history of theses artic predators. Like the scientific process, the book opens with observations, observations of snowies in places where they are not normally found, especially in large numbers (a snow owl irruption). Then the true story follows scientists, birders, and volunteers a Have you heard of the 2013-2014 snowy owl irruption? Sandra Markle’s 2018 book, Snowy Owl Invasion! : Tracking an Unusual Migration delves into this remarkable historical event, and deftly weaves in a thorough natural history of theses artic predators. Like the scientific process, the book opens with observations, observations of snowies in places where they are not normally found, especially in large numbers (a snow owl irruption). Then the true story follows scientists, birders, and volunteers as they research why so many birds migrated so far south that year. The possible answers are tied to weather patterns and an artic food web based on lemmings. Scientists also took advantage of the great number and unusually easy access to these birds to gain more fundamental knowledge of them, particularly about their wintertime behavior and migrations. Sandra Markle shares their new insights and how they were gleaned in the text, on maps and in a second layer of information associated with the stunningly clear and close-up photographs. She also shares how the basic information had practical applications, showing how science can be applied to solve problems, helping to keep owls and people safe. An author’s note gives a sneak-peak of her investigation behind the story and emphasizes how she uses firsthand knowledge to create her books. Source notes, glossary, index and a section on where to find more information round out the book. What I love about this book: I love how it’s a book not only about an animal I hardly knew and guess that many children won’t be familiar with either, but also a book about how we know what we know about snowies. It shows science being done, and not just by official scientists. It shows how science is a cooperative effort and can benefit everyone. A thread of the connectivity of life also runs through the pages and helps the reader understand why we must be concerned with an arctic owl that seems so removed from our daily lives. All the pages have show-stopper photographs or interesting graphics. A great resource for looking at how science is done in the field. It’s a must-read for budding biologists and everyone interested in animals and science. Suggested for ages 8-12, grades 3-6. In the winter of 2013-2014, birdwatchers and scientists started spotting unusually high numbers of snowy owls in unusual locations, well beyond Canada, with some as far south as Florida! The snowy owl population had boomed the previous summer– this sudden increase in a population is called an irruption. Fierce competition for territory pushed them beyond their normal range. Scientists worked quickly to take advantage of the irruption, trying to add identification bands to as many birds as possib In the winter of 2013-2014, birdwatchers and scientists started spotting unusually high numbers of snowy owls in unusual locations, well beyond Canada, with some as far south as Florida! The snowy owl population had boomed the previous summer– this sudden increase in a population is called an irruption. Fierce competition for territory pushed them beyond their normal range. Scientists worked quickly to take advantage of the irruption, trying to add identification bands to as many birds as possible. They were also able to crowdfund 2 dozen battery-powered GPS transmitters. Over the next 2-3 years, the data from these transmitters revealed surprising new insights into snowy owl behavior, as scientists learned that these birds fly higher, faster, and farther than expected. Interested readers can check out Project SNOWstorm’s website for further updates on the birds’ trackers. This book is exemplary expository non-fiction – the text is engaging, informative, and well-paced, with beautiful and well-chosen visual supports. Small yellow insets throughout add details about the snowy owls without interrupting the flow, while longer explanations for important context are easily identified by a blue background and swooping curves at the bottom. Most of the text is on a plain white background but the text overlaid on pictures is still easily readable. One final thing to appreciate – in her author’s note, Markle shares how her project grew organically, tracking how a conversation with one expert led her to another expert. It’s a great example for teachers to show how research is an iterative process. Markle, Sandra Snowy Owl Invasion! Tracking an Unusual Migration, 46 pages. NON-FICTION. Millbrook (Lerner), 2018. $24. The winter of 2013-2014 brought an unprecedented number of snowy owls to the United States. Normally these birds stay all year in the Arctic. Scientists took advantage of the flocks by banding many and attaching transmitters to others in order to study the flight patterns – research that they have not been able to conducted previously. Because the banding happened so recently, sc Markle, Sandra Snowy Owl Invasion! Tracking an Unusual Migration, 46 pages. NON-FICTION. Millbrook (Lerner), 2018. $24. Because the banding happened so recently, scientists are just beginning to use the data they have been collecting. Because if this, there really isn’t a section about the uses for the research or things that the general populous should be aware of. In that regard, this book is a little less useful than Markle’s other books. Don’t get me wrong – the bandings and transmitter part is cool, just not what I normally expect. And the photographs – top notch! Solid science for elementary readers packed with gorgeous appealing photographs. The winter of 2013-14 brought an unusual "irruption" of snowy owls to places they are rarely seen in the United States. Scientists leaped on the opportunity to understand these cycles of migration and learn more about the snowy owls. Markle's well-written text is clear, wonderfully geared to young readers and tells a fascinating story of scientists at work. Some new technology adds a very interesting dimension to res Solid science for elementary readers packed with gorgeous appealing photographs. I'd love to add seeing a snowy owl to my Life List. Apparently, my chance to see one without traveling happened in 2013. Markle deftly explains the "irruption" as well as efforts of scientists to track the possibly new migration patterns. The accompanying photos are gorgeous. The maps are helpful to understand just how unusual this event was. Backmatter includes an author's note, source notes, glossary and websites for finding out more about snowy owls. What an adventure! You can never learn enough about Mother Nature and her world. Follow this group of scientists as they track a change in the snowy owl migration pattern. What caused it and how these birds maybe effected by climate changes. Watch carefully you may see one even if you live in South Carolina or Florida. Of particular interest is the author's note explaining how she researched the researchers. This is published as a picture book and the text is aimed at children, though definitely not for children under school age. So, just right for an adult who is crazy about owls. It's an account of a year when snowy owls migrated much further south than is normal, and is about the author finding out the whys and wherefores. Fascinating. And beautifully illustrated. A gold mine for a kid working on a research project about snowy owls. Great narrative, breakouts for additional scientific facts, a terrific back matter piece on how the author researches a project (meta!) and fantastic photographs illustrating the work. This is a very interesting story about the season in 2013-2014 where snowy owls ranged farther than anyone could have imagined. Sandra Markle explains what happened and why in a very compelling way. The photographs are so beautiful and so interesting. Don't miss this one! Well written narrative about the snowy owl irruption in 2013-14. The author provides facts and information on the efforts made to determine why this happened and the methods used to track migrations. Wow! The breathtaking cover photo of a snowy owl in flight is amazing. Interesting text about a snowy owl "irruption" that occurred in 2013-14. Fascinating discoveries and great use of technology to track the snowy owls' Arctic treks. Great photos throughout! What a great book! This one was particularly timely for me as I've been seeing reports from our local Audubon society of snowy owls in my area. The photographs in this book are wonderful and the information is clearly presented. Good information, engagingly told with lots of wonderful, clear color photographs. Back matter includes Author's note, source notes, glossary, further reading, index and photo acknowledgements. An informative book for young people about the "irruption," of snowy owls during 2012-2013. Maps and photos. Interesting animal non-fiction. Best for grades 4-6. Interesting book about the snowy owl irruption in 2013. Disappointed that photos were not taken by the author. Most were stock. Wonderful read for animal lovers. Even though it's a picture book. It reads more like a middle-grade non-fiction. So much depth!